The doctors at Sachem Eye Care have extensive experience in the pre-operative and post- operative care of Lasik sugery and other vision correction procedures. Lasik is currently the most popular vision correcting or refractive surgery available but there are also other options. We will help you find the ideal solution for your condition. We partner with the most trusted surgeons on Long Island to insure a successful procedure. 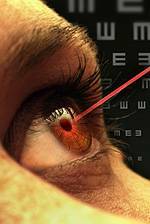 Lasik is short for “laser assisted in situ keratomileusis”. It has advantages over other refractive procedures, including lack of pain afterward and quick recovery time. You will usually see clearly the very next day. Lasik, once done with a blade or microkeratome, is now completely done with a laser to assure precise and accurate outcomes. The laser creates a corneal flap and once folded back the excimer laser uses cool ultraviolet light to remove or ablate small layers of the cornea in order to reshape the corneal surface and correct your vision. Both nearsighted and farsighted people can benefit from the Lasik procedure. With nearsighted patients the goal is to flatten the cornea whereas with farsighted people the goal is to steepen the cornea. The excimer laser can also correct small to moderate amounts of astigmatism. At Sachem Eye Care we hold free consultations quarterly to confirm whether or not you are a good candidate for this procedure. Call for your appointment today!! !